Wasps scrum-half Joe Simpson was born in Australia to a New Zealand mother and an English father, but his heart is certainly English as he has worn the red rose at every age-group up to senior level. A graduate of the London club's academy, Simpson made his debut for the first team during the 2008/9 season, often coming off the bench. He scored on his debut and was fourth in that season's Try of the Season competition. He signed a two-year senior contract in 2009 and played 22 times, scoring two tries. Simpson's senior international career began with a spell with the England Sevens team in 2007 and he went on to represent the Saxons in 2009. His performances in the 09/10 season earned him a spot in Martin Johnson's touring squad for the end of season visit to the land of his birth. In December 2010 Wasps announced that Simpson had signed a new three-year extension with the club. He had further cause for celebration the following month when, having been overlooked for the autumn internationals, he was named in the England squad for the 2011 Six Nations on the back of a terrific run of form. 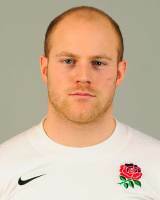 Simpson did not get any game time for England during the Six Nations, but in June he was named in the 45 man training squad for the 2011 World Cup. An injury to rival Danny Care meant Simpson made the final cut but he made just one replacement's appearance during the World Cup.